I used to eat at Sonic at least twice a week when I was in highschool. Needless to say I was a fat kid. But burgers were cheap back then. It was a horrifying rotation of Wendy's, Sonic, and Arby's - it's a wonder I didn't need an angioplasty by age 19. But then again, the chili cheese tator tots at Sonic are amazing, and now you can get some in Peabody. Limeades. Cream Slushes. Java Chillers. The drinks sound a bit unfamiliar to a lifelong New Englander like me who grew up in the land of frappes, Fribbles and Awful Awfuls. But they’ll be sure to put a smile on the faces of Sonic aficionados in Massachusetts who have been waiting patiently for the day when the Oklahoma City-based chain finally opens its first shop here. Well, Sonic fans, it’s almost time to rev up your engines and head to Route 1 in Peabody. 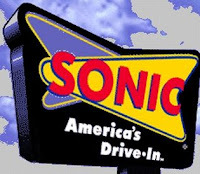 Mark your calendars: Local franchisee Gina Monastiero told me today that her long-awaited Sonic drive-in restaurant will open for business at 10 a.m. on Wednesday, Aug. 26. After opening day, Monastiero says she plans to keep the restaurant open from 6 a.m. to 2 a.m., seven days a week, staffed with at least 120 full- and part-timers. Has anyone had a chance to make it to Peabody yet and try it out? May as well make a day of it: Sonic for lunch, then an afternoon at the Peabody Essex Museum, and then dinner at Sonic. 2 Response to "First Sonic In MA Open in Peabody"